UniFi Switch 48 Gigabit Ethernet Ports, 24V / 802.3af / 802.3at PoE, (750W max power), 2x 10G SFP+ Ports, 2x SFP Ports. 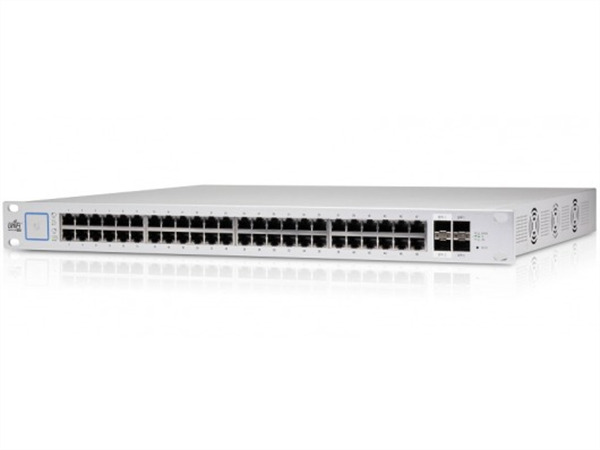 The US-48-750W UniFi Managed PoE+ Gigabit 48 RJ45 Port 750W Switch from Ubiquiti Networks offers the forwarding capacity to simultaneously process traffic on all ports at line rate without any packet loss. It provides a total non-blocking throughput of up to 70 Gb/s. The UniFi Switch provides fiber connectivity options for easy expansion of your networks. Each UniFi Switch includes two SFP ports for uplinks of up to 1 Gb/s. By default, the UniFi Switch automatically detects 802.3af/at devices so they automatically receive PoE and 24V passive PoE to power multiple devices on the network. The 48-port switch adds two SFP+ ports for high-capacity uplinks of up to 10 Gb/s, so you can directly connect to a high-performance storage server or deploy a long-distance uplink to another switch. The switch supports an extensive suite of advanced Layer-2 switching features and protocols, and also provides Layer-3 routing capability. It integrates seamlessly into the UniFi Software-Defined Networking (SDN) platform to create a highly scalable, end-to-end system of network devices across multiple locations — all controlled from a single interface.